The Erebus glacier in Antarctica comes down from Mt. 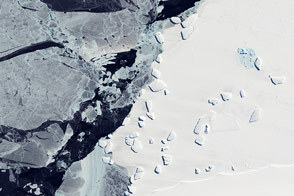 Erebus and protrudes off the coast of Ross Island, forming an 11-12 km long ice tongue—a long and narrow sheet of ice projecting out from the coastline. 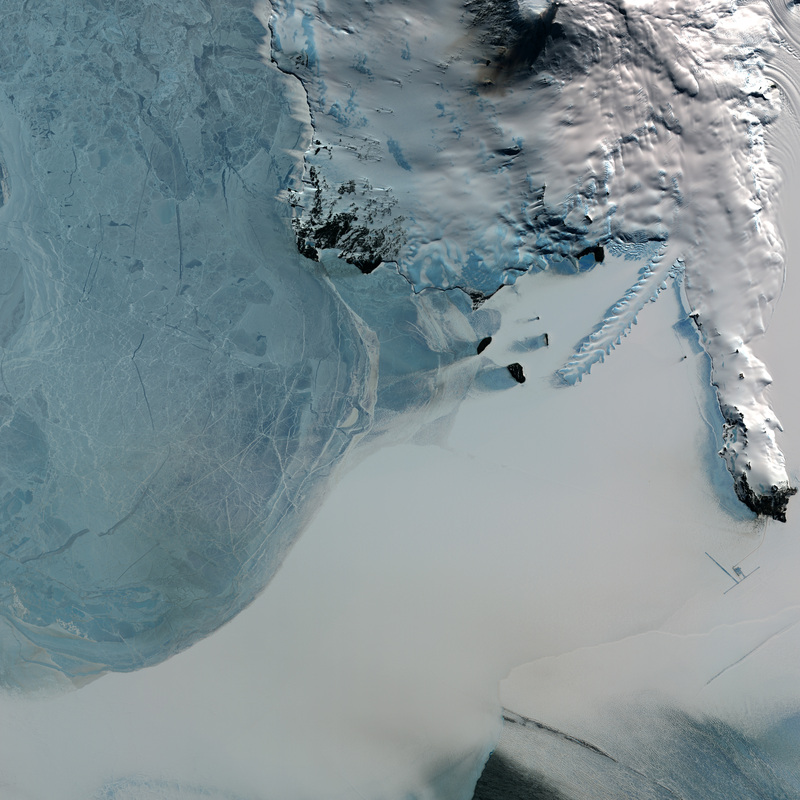 The Erebus Ice Tongue is the serrated, blue-rimmed “knife” extending toward image center from the upper right out into snow- and ice-covered McMurdo Sound. Beneath the smooth white expanse is the Southern Ocean. An ice tongue forms when a valley glacier moves very rapidly out into the sea or a lake. When the sea ice in McMurdo sound thaws in the summer, the ice tongue floats on the water without thawing. It also calves off in places forming icebergs. The Erebus Ice Tongue is only about 10 meters high, so its icebergs are small. When the ice around the tongue melts in the summer, waves of sea water constantly batter the edges of the tongue, carving very elaborate structures in the ice, sometimes producing deep caves at the margins. In the winter, the sea freezes once more around these new shapes. This false-color composite image was acquired by the Advanced Spaceborne Thermal Emission and Reflection Radiometer (ASTER) on the Terra satellite. The image was created by combining near-infrared, red, and green wavelengths (ASTER bands 3, 2, & 1 respectively). The image was acquired on November 30, 2001, in the thin light of permanent “dawn” that the continent experiences during the Southern Hemisphere spring. 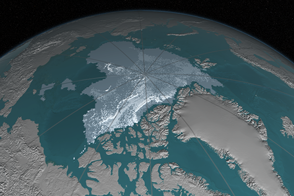 NASA image created by Jesse Allen, using data provided courstesy of NASA/GSFC/METI/ERSDAC/JAROS, and the U.S./Japan ASTER Science Team. The Erebus glacier in Antarctica comes down from Mt. 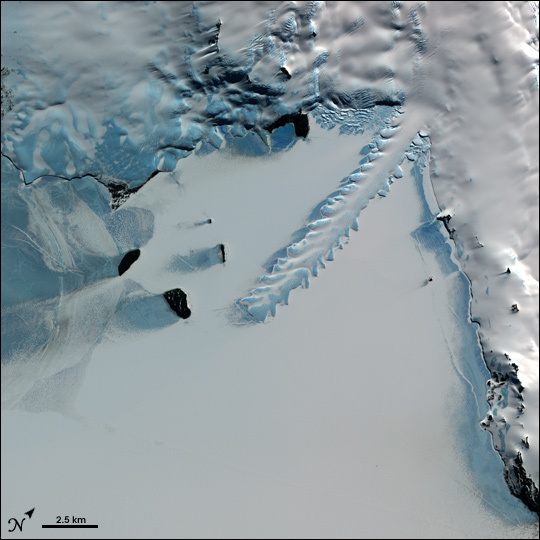 Erebus and protrudes off the coast of Ross Island, forming an 11-12 km long ice tongue—a long and narrow sheet of ice projecting out from the coastline.